Duckweed is a group of ubiquitous pond plants found throughout the continental United States, Canada and elsewhere in the world. While the term “duckweed” generally refers to the common species of the plant, the name is also used to denote several other species of tiny, floating, sometimes rootless aquatic plants which thrive in undisturbed waters. Though consumed by many types of animals, duckweed spreads rapidly and can prevent sunlight from penetrating the water’s surface. Duckweed is most commonly seen on the placid surface of ponds and lakes, forming a pebble-textured green veil on the water’s surface. Duckweed is one of the smallest flowering plants, though the tiny white flowers are rarely seen. Plants typically have only two leaves, and while most species have several small roots hanging down into the water, some species are rootless. Northern species of duckweed form small pods which sink down to the lakebed in winter; plants break dormancy in spring when the pods rise along with the temperatures. Duckweed is extremely tiny: even the largest species, giant duckweed (Spirodela polyrhiza), is no more than ¼ inch across. Nine species of Lemna and two species of Spirodela comprise what is known as pond duckweed, with the most commonly distributed of these being lesser duckweed (Lemna minor). Northern types are hardy and enter dormancy during the winter, though in warmer climates duckweed can be evergreen and become invasive. 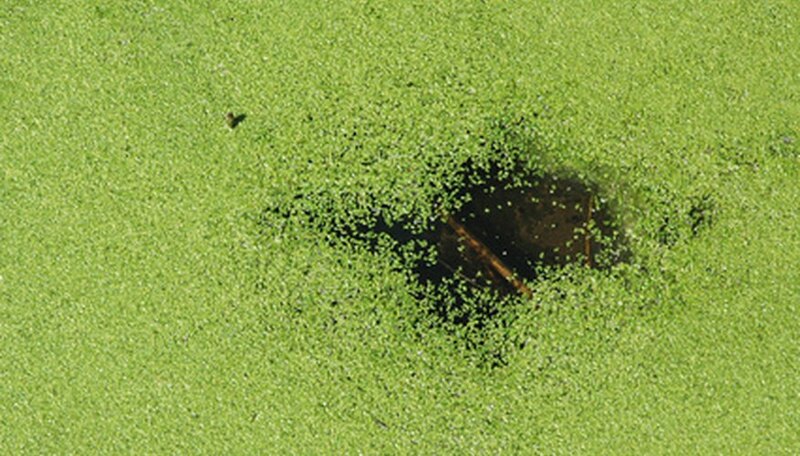 Many species of duckweed usually occur together in one body of water. As the name implies, duckweed is a food source for ducks and other aquatic birds, which eat the vegetation. Beavers, muskrats, herons, frogs and other aquatic species also depend on the plant for food. In nature as in ornamental ponds, duckweed is a good source of food for fish, as well. Duckweed can provide good mosquito control in residential ponds when it completely covers the water’s surface, as larvae cannot break the surface for air and perish. Ducks, geese and other birds easily transport specimens from one body of water to the next. Under ideal conditions, a single plant can reproduce itself every three days, and in the absence of sufficient herbivores a small pond will be covered in a matter of weeks. Especially in warmer zones where duckweed does not enter winter dormancy, it can become extremely invasive, killing off submerged aquatic vegetation which then leads to fish kills from reduced oxygen saturation. Plant control can be accomplished via mechanical removal or use of aquatic herbicide. USDA analysis of duckweed indicates the plant is composed, on average, of 38 percent protein and 35 percent carbohydrate, making it particularly high in nutritive value. For this reason, it is often gathered for use as animal feed in parts of Asia, Africa and India. Plants also metabolize nutrients quickly, which has made it a target for experiments to determine duckweed’s potential use for treating sewage and stormwater. In 1998, trials conducted in Minnesota indicated several species of duckweed remove large amounts of ammonia, nitrogen and phosphorous from stormwater retention ponds in eight weeks, which can then be harvested and recycled for use as cattle feed.